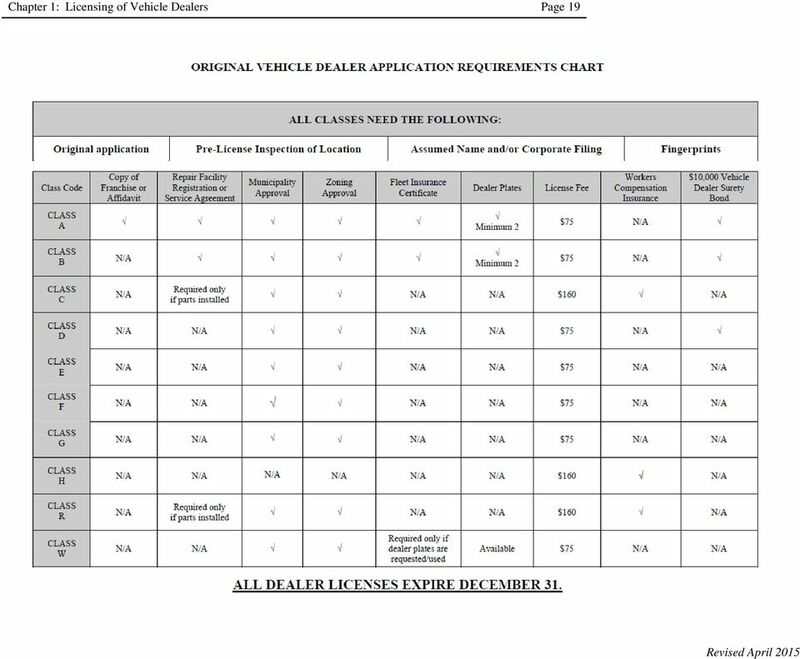 Download "Chapter 1 Licensing of Vehicle Dealers"
2 Chapter 1: Licensing of Vehicle Dealers Page 2 Change of Address a Established Place of Business Requirements for New and Used Vehicle Dealers. 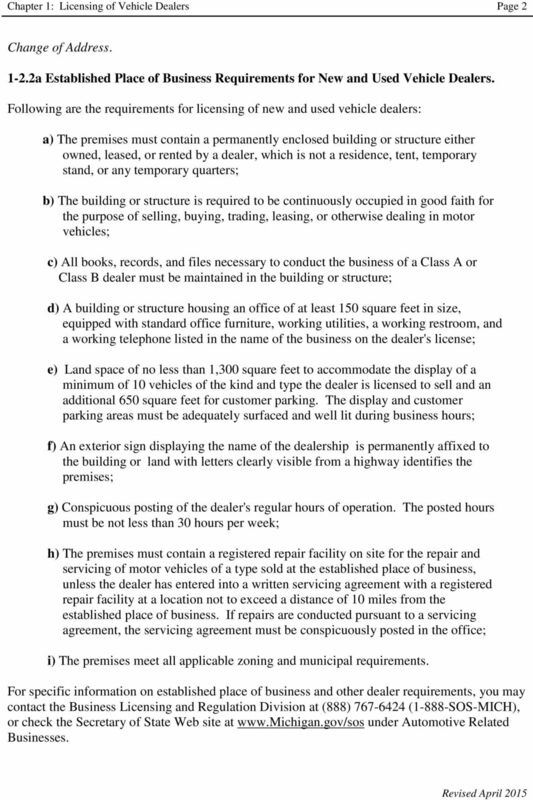 Following are the requirements for licensing of new and used vehicle dealers: a) The premises must contain a permanently enclosed building or structure either owned, leased, or rented by a dealer, which is not a residence, tent, temporary stand, or any temporary quarters; b) The building or structure is required to be continuously occupied in good faith for the purpose of selling, buying, trading, leasing, or otherwise dealing in motor vehicles; c) All books, records, and files necessary to conduct the business of a Class A or Class B dealer must be maintained in the building or structure; d) A building or structure housing an office of at least 150 square feet in size, equipped with standard office furniture, working utilities, a working restroom, and a working telephone listed in the name of the business on the dealer's license; e) Land space of no less than 1,300 square feet to accommodate the display of a minimum of 10 vehicles of the kind and type the dealer is licensed to sell and an additional 650 square feet for customer parking. The display and customer parking areas must be adequately surfaced and well lit during business hours; f) An exterior sign displaying the name of the dealership is permanently affixed to the building or land with letters clearly visible from a highway identifies the premises; g) Conspicuous posting of the dealer's regular hours of operation. The posted hours must be not less than 30 hours per week; h) The premises must contain a registered repair facility on site for the repair and servicing of motor vehicles of a type sold at the established place of business, unless the dealer has entered into a written servicing agreement with a registered repair facility at a location not to exceed a distance of 10 miles from the established place of business. If repairs are conducted pursuant to a servicing agreement, the servicing agreement must be conspicuously posted in the office; i) The premises meet all applicable zoning and municipal requirements. 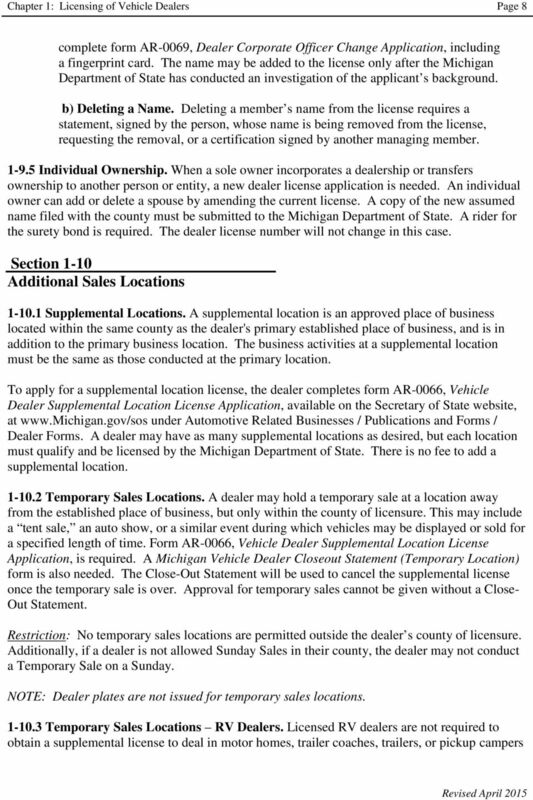 For specific information on established place of business and other dealer requirements, you may contact the Business Licensing and Regulation Division at (888) (1-888-SOS-MICH), or check the Secretary of State Web site at under Automotive Related Businesses. 3 Chapter 1: Licensing of Vehicle Dealers Page b Established Place of Business Requirements for Wholesale Vehicle Dealers. An established place of business for a wholesaler must satisfy all of the following requirements: a) the premises must contain a permanently enclosed building or structure is either owned, leased, or rented by a wholesaler, which is not a commercial mailbox, tent, temporary stand, or other temporary quarters; b) All books, records, and files necessary to conduct the business of the wholesaler must be maintained in the building or structure described in subdivision a); c) The premises must not be used for the display of vehicles. However, the premises may be used for the storage of vehicles purchased by the wholesaler prior to sale to a licensed vehicle dealer; d) The premises must be identified by an exterior sign displaying the name of the wholesaler is permanently affixed to the building or land with letters clearly visible from the roadway; e) The premises meet all applicable zoning and municipal requirements Requirements for All Vehicle Dealers. 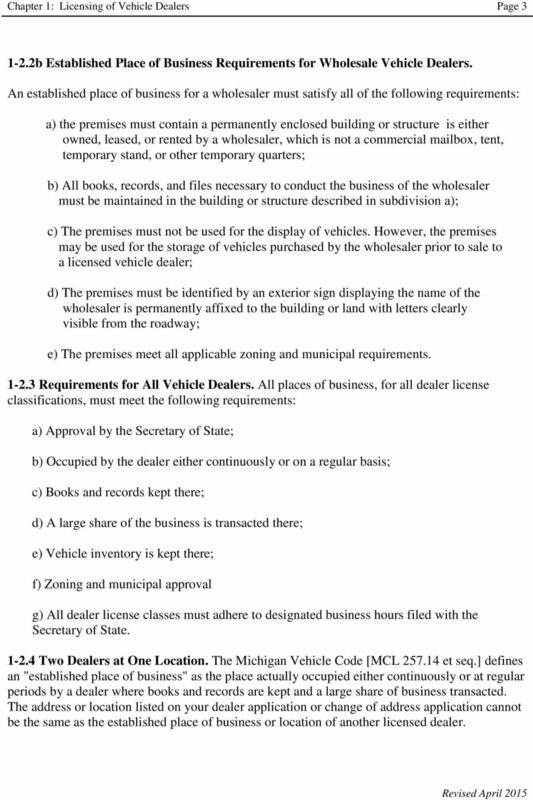 All places of business, for all dealer license classifications, must meet the following requirements: a) Approval by the Secretary of State; b) Occupied by the dealer either continuously or on a regular basis; c) Books and records kept there; d) A large share of the business is transacted there; e) Vehicle inventory is kept there; f) Zoning and municipal approval g) All dealer license classes must adhere to designated business hours filed with the Secretary of State Two Dealers at One Location. The Michigan Vehicle Code [MCL et seq.] defines an "established place of business" as the place actually occupied either continuously or at regular periods by a dealer where books and records are kept and a large share of business transacted. The address or location listed on your dealer application or change of address application cannot be the same as the established place of business or location of another licensed dealer. 4 Chapter 1: Licensing of Vehicle Dealers Page 4 By statute, the proposed address or location can only be the established place of business of one licensed vehicle dealer. If two dealers are located in close proximity, there must be a clear separation between the vehicle dealership businesses. This includes separate addresses, inventories, office spaces, customer parking, restrooms, etc. Please note: Businesses cannot share or pool resources to meet established place of business requirements. Each business must separately meet the requirements. The Business Licensing & Regulation Division will evaluate each original dealer license application submission where it appears more than one dealer is occupying a location on a case-by-case basis Additional Locations in Same County. A dealer license authorizes the dealer to conduct business at a principal place of business in a particular county. Additional locations in the same county can be licensed as supplemental locations, at no additional fee, if the same activities will be conducted. If the types of activity differ, a separate dealer license may be required Another County. A separate dealer license is required if a dealer sells at retail in another county or establishes a place of business in another county. Section 1-3 Workers Compensation Insurance Requirements. Used vehicle parts dealers (Class C) and automotive recyclers (Class R) must maintain workers' compensation insurance for employees classified as automobile dismantlers, or else have an insurance exemption from the Office of Financial and Insurance Services. Foreign salvage vehicle dealers (Class H) must maintain workers' compensation insurance as required by their home states. 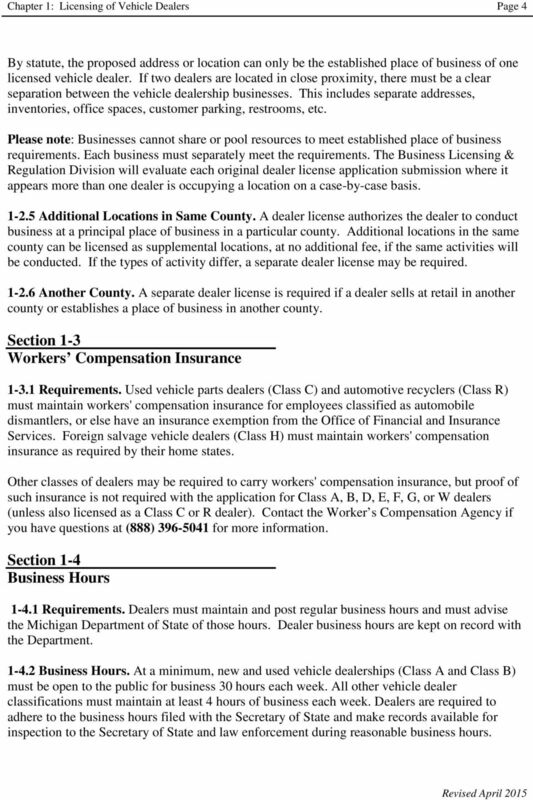 Other classes of dealers may be required to carry workers' compensation insurance, but proof of such insurance is not required with the application for Class A, B, D, E, F, G, or W dealers (unless also licensed as a Class C or R dealer). Contact the Worker s Compensation Agency if you have questions at (888) for more information. Section 1-4 Business Hours Requirements. Dealers must maintain and post regular business hours and must advise the Michigan Department of State of those hours. Dealer business hours are kept on record with the Department Business Hours. At a minimum, new and used vehicle dealerships (Class A and Class B) must be open to the public for business 30 hours each week. All other vehicle dealer classifications must maintain at least 4 hours of business each week. Dealers are required to adhere to the business hours filed with the Secretary of State and make records available for inspection to the Secretary of State and law enforcement during reasonable business hours. 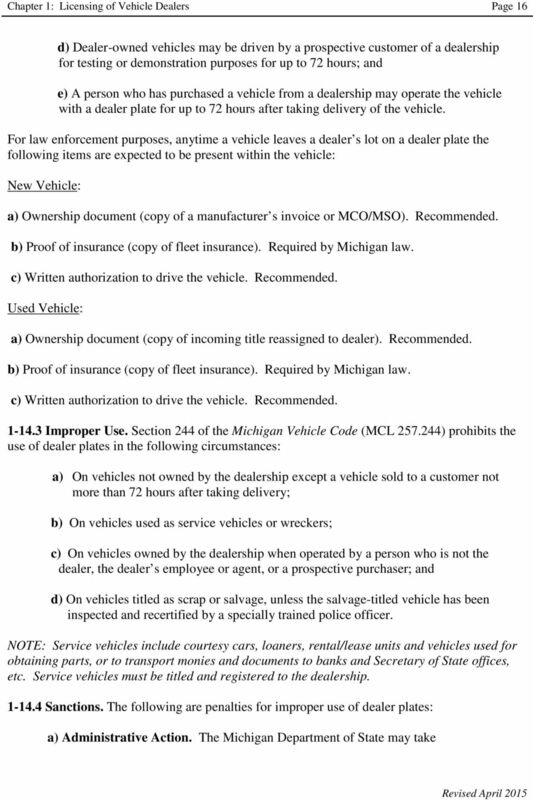 6 Chapter 1: Licensing of Vehicle Dealers Page 6 to maintain a minimum of 20/40/10 fleet-type Michigan no-fault vehicle insurance. The insurance certificate must indicate coverage for either all-owned vehicles or any vehicle. A copy of the proof of insurance must be maintained in each vehicle leaves the lot, including test drives. Section 1-7 Dealership Changes Requirements. 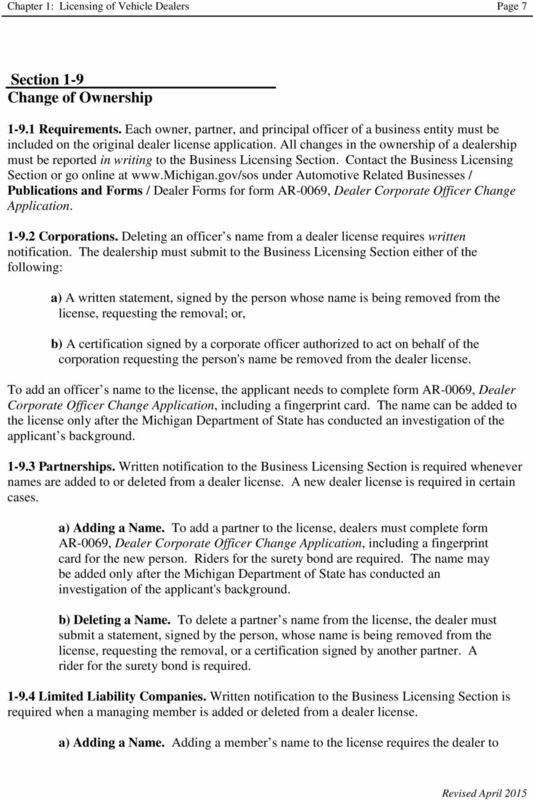 Changes in ownership, officers, location, business hours, type of business, franchise status, and dealer classifications are examples of changes require notification or approval by the Michigan Department of State Application. Dealers must complete and submit an original application for a license (form AR-0032) or (form AR-0068) Vehicle Dealer License Application Change of Name and/or Change of Address, to request a change. Section 1-8 Change of Address or Change of Business Name Postal Changes. If a dealer's business address is changed by the Post Office but the dealership has not moved, the dealer must submit a copy of the postal notice to the Business Licensing Section Moves within Same County. 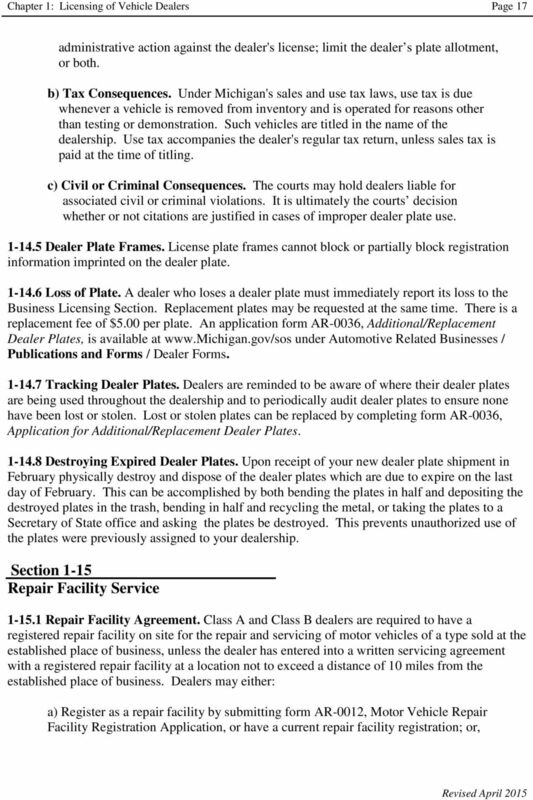 When a dealer anticipates a move to a new location within the same county, the dealer must complete form AR-0068, Vehicle Dealer License Application Change of Name and/or Change of Address, which is available from the Business Licensing Section or online at under Automotive Related Businesses / Publications and Forms / Dealer Forms. The dealer must include municipal and zoning approvals for the new location. Change of address riders for the surety bond and fleet insurance are required for Class A, B, and D dealers Moves from One County to Another. When a dealer anticipates a move to a new location in another county, the dealer must complete form AR-0068, Vehicle Dealer License Application Change of Name and/or Change of Address. Change of address riders for the surety bond and fleet insurance are required. Sole proprietorships and partnerships must provide a copy of the assumed name filing in the new county. Dealers must include municipal and zoning approvals for the new location Change of Name. 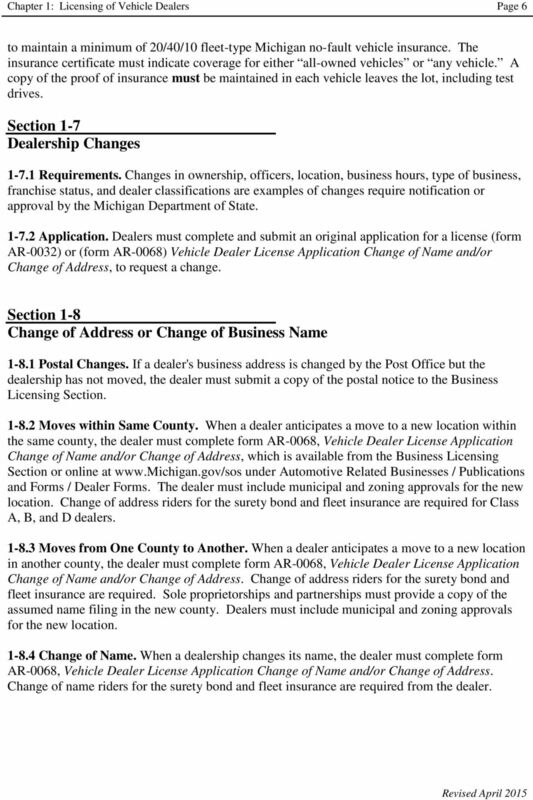 When a dealership changes its name, the dealer must complete form AR-0068, Vehicle Dealer License Application Change of Name and/or Change of Address. Change of name riders for the surety bond and fleet insurance are required from the dealer. 9 Chapter 1: Licensing of Vehicle Dealers Page 9 at a recreational vehicle show if all of the following apply: a) The dealer is licensed as a new or used vehicle dealer (Class A or B); and, b) The duration of the recreational vehicle show is not more than 14 days; and, c) Not less than 14 days before the beginning date of the recreational vehicle show, the show producer submits a Recreational Vehicle Show application form to the following address: Michigan Department of State, Business Licensing Section, Lansing, Michigan, The form may be faxed to the Business Licensing Section at (517) A copy of the form is available online at under Automotive Related Businesses / Publications and Forms / Dealer Forms. Section 1-11 Going Out of Business Requirements. When closing a dealership, including a supplemental location, a dealer must complete a Vehicle Dealer Close-Out Statement. The dealer must return the wall license, dealer plates, and unused temporary registrations to any Secretary of State office or they can be mailed to the Business Licensing Section Vehicles in Inventory. Dealers who do not dispose of inventory before going out of business may be left with inventory cannot be transferred without a dealer license. There is a rebuttable presumption anyone who sells five or more vehicles in a 12-month period without a dealer license is operating as an unlicensed dealer and administrative fines may be assessed. Any vehicles owned at the time of closing must be titled in the dealership owner s name and sales tax paid, according to the fair market value of each vehicle. When closing only a supplemental location, vehicles left in inventory can be transferred either to the main location or to another supplemental location. Section 1-12 Designated Branches Dealer Selection for Designated Branch Offices Form. All new and used vehicle dealers are required to designate up to three Secretary of State branch offices where transactions will be submitted. The first choice entered on the Dealer Selection for Designated Branch Offices form will identify the only branch where BFS-4, 15-day temporary registrations will be purchased. When selecting up to three SOS branch offices dealers may wish to consider selecting at least one SOS instant title branch and an SOS branch with hours on Saturday. CVR dealers may designate other SOS branches for processing RD-108 transactions not permissible to process under the CVR program standards. 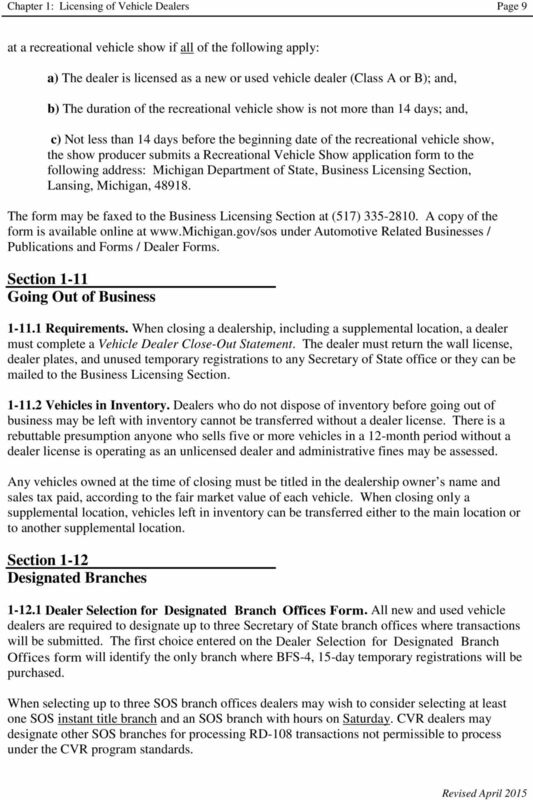 10 Chapter 1: Licensing of Vehicle Dealers Page 10 Note: A vehicle dealer may only change SOS branch office designations one time each calendar year by submitting the Dealer Selection for Designated Branch Offices Form unless special circumstances are present (e.g., branch closure, dealer change of address, etc.) This includes designated branch changes at renewal time. Special requests will be evaluated on a case-by-case basis. 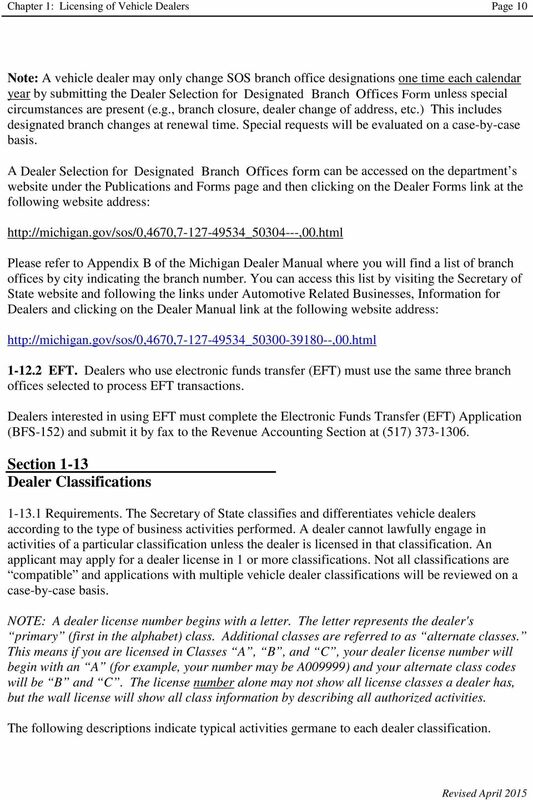 A Dealer Selection for Designated Branch Offices form can be accessed on the department s website under the Publications and Forms page and then clicking on the Dealer Forms link at the following website address: Please refer to Appendix B of the Michigan Dealer Manual where you will find a list of branch offices by city indicating the branch number. You can access this list by visiting the Secretary of State website and following the links under Automotive Related Businesses, Information for Dealers and clicking on the Dealer Manual link at the following website address: EFT. Dealers who use electronic funds transfer (EFT) must use the same three branch offices selected to process EFT transactions. Dealers interested in using EFT must complete the Electronic Funds Transfer (EFT) Application (BFS-152) and submit it by fax to the Revenue Accounting Section at (517) Section 1-13 Dealer Classifications Requirements. The Secretary of State classifies and differentiates vehicle dealers according to the type of business activities performed. A dealer cannot lawfully engage in activities of a particular classification unless the dealer is licensed in that classification. An applicant may apply for a dealer license in 1 or more classifications. Not all classifications are compatible and applications with multiple vehicle dealer classifications will be reviewed on a case-by-case basis. NOTE: A dealer license number begins with a letter. The letter represents the dealer's primary (first in the alphabet) class. Additional classes are referred to as alternate classes. This means if you are licensed in Classes A, B, and C, your dealer license number will begin with an A (for example, your number may be A009999) and your alternate class codes will be B and C. The license number alone may not show all license classes a dealer has, but the wall license will show all class information by describing all authorized activities. The following descriptions indicate typical activities germane to each dealer classification. 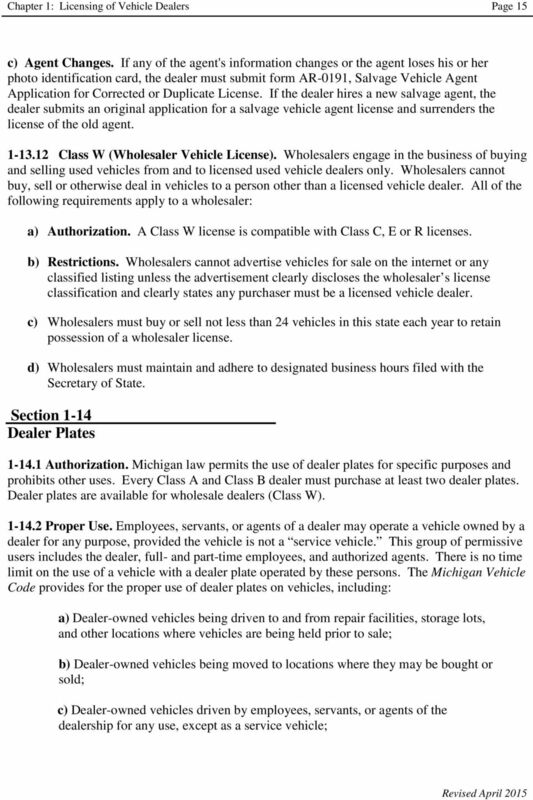 12 Chapter 1: Licensing of Vehicle Dealers Page 12 Wholesaler Vehicle License Class D (Broker). A broker is a dealer who, for compensation, brings a buyer and seller together, negotiates the terms of a transaction, or displays a vehicle offered for sale. In the broker's role regarding the sale, purchase, lease or exchange of vehicles or salvageable parts, the broker does not have any ownership interest in the vehicle or salvageable part. A person who conducts a vehicle auction is a type of broker and requires a Class D license. a) Authorization. The Class D license is compatible only with a Class G license. b) Prohibited Practices. A broker cannot acquire ownership of vehicles or their major component parts. c) Restrictions. Brokers have restrictions in selling late model distressed vehicles. A broker, salvage pool or auction may sell, transfer, or release a late model distressed vehicle, salvage vehicle, scrap vehicle, or salvageable part only to: 1) The vehicle s former owner; or, 2) A licensed Salvage Vehicle Agent representing a Used Vehicle Parts Dealer (Class C), a Foreign Salvage Vehicle Dealer (Class H), or an Automotive Recycler (Class R) Class E (Distressed Vehicle Transporter). 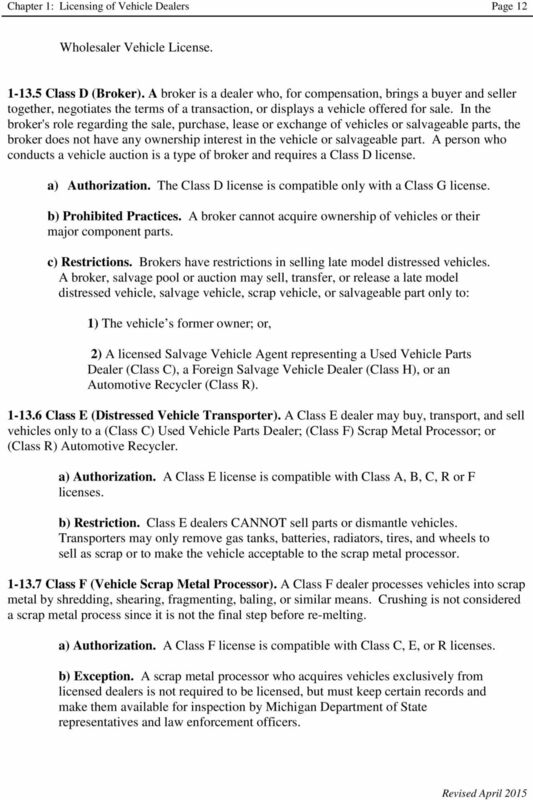 A Class E dealer may buy, transport, and sell vehicles only to a (Class C) Used Vehicle Parts Dealer; (Class F) Scrap Metal Processor; or (Class R) Automotive Recycler. a) Authorization. A Class E license is compatible with Class A, B, C, R or F licenses. b) Restriction. Class E dealers CANNOT sell parts or dismantle vehicles. Transporters may only remove gas tanks, batteries, radiators, tires, and wheels to sell as scrap or to make the vehicle acceptable to the scrap metal processor Class F (Vehicle Scrap Metal Processor). A Class F dealer processes vehicles into scrap metal by shredding, shearing, fragmenting, baling, or similar means. Crushing is not considered a scrap metal process since it is not the final step before re-melting. a) Authorization. A Class F license is compatible with Class C, E, or R licenses. b) Exception. 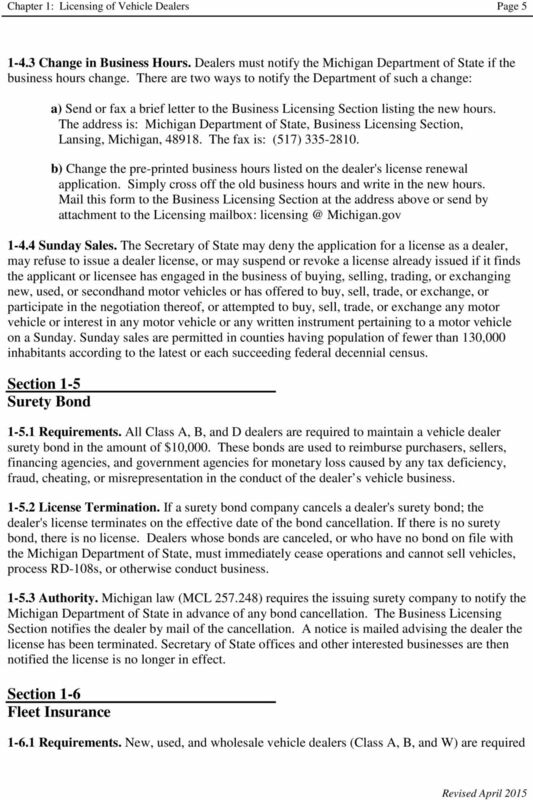 A scrap metal processor who acquires vehicles exclusively from licensed dealers is not required to be licensed, but must keep certain records and make them available for inspection by Michigan Department of State representatives and law enforcement officers. 13 Chapter 1: Licensing of Vehicle Dealers Page Class G (Vehicle Salvage Pool). A Class G dealer stores and displays damaged or distressed vehicles for insurance companies and cannot have an assigned title or any other ownership interest in the vehicle. a) Authorization. A Class G license is compatible only with a Class D license. b) Restrictions. Salvage pools cannot sell vehicles to repair facilities. The salvage pool, like auctions and brokers, can only sell, transfer or release late model distressed vehicles, salvage or scrap vehicles and late model major component parts to one of the following: 1) The vehicle's former owner; or, 2) A licensed Salvage Vehicle Agent representing a Used Vehicle Parts Dealer (Class C), a Foreign Salvage Vehicle Dealer (Class H), or an Automotive Recycler (Class R) Class H (Foreign Salvage Vehicle Dealer). A Class H dealer is licensed in another state and is engaged in this state in the business of purchasing, selling, or otherwise dealing on a wholesale basis in salvageable parts or late model distressed vehicles. This dealer buys or otherwise acquires late model major component parts (see Chapter 5) for resale, either at wholesale or at retail. The dealer may also acquire whole vehicles to dismantle for the resale of parts, selling the remainder as scrap. The Used Vehicle Parts Dealer (Class C) and the Automotive Recycler (Class R) licenses, are the only other dealer classifications possessing the authority to buy late model distressed vehicles (salvage or scrap vehicles) or late model major component parts from auctions, brokers, or salvage pools in Michigan. a) Authorization. 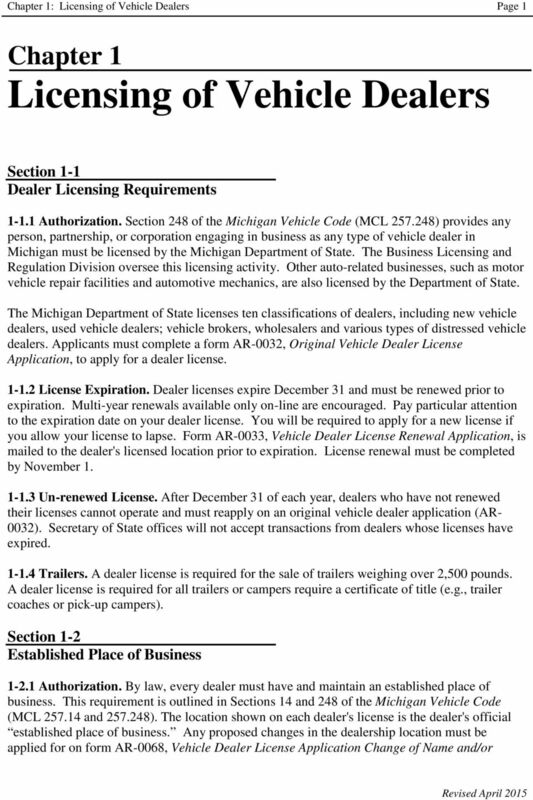 A Class H license is not compatible with any other Michigan vehicle dealer license. The foreign salvage vehicle dealer must also be licensed in their home state as a salvage dealer in vehicles or parts. b) Restrictions. A Class H dealer can only buy or sell late model distressed vehicles or late model major component parts at Michigan auctions, brokers, or salvage pools when represented by its licensed Salvage Vehicle Agent. 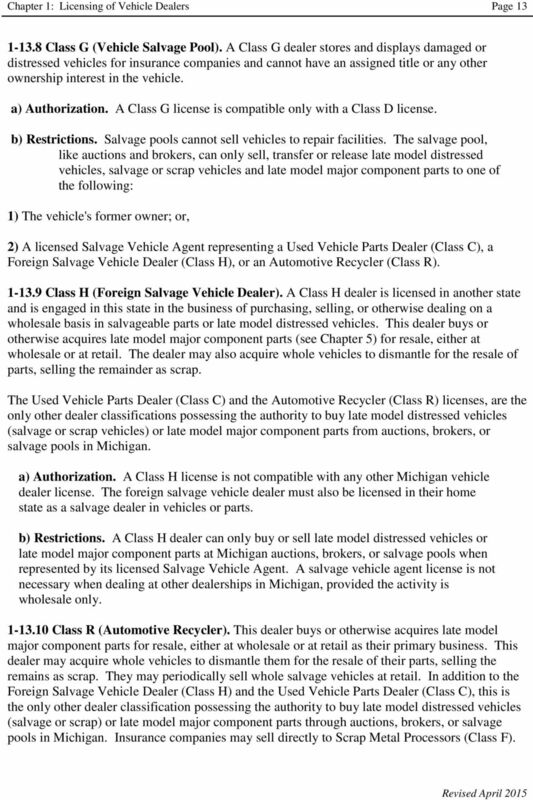 A salvage vehicle agent license is not necessary when dealing at other dealerships in Michigan, provided the activity is wholesale only Class R (Automotive Recycler). This dealer buys or otherwise acquires late model major component parts for resale, either at wholesale or at retail as their primary business. This dealer may acquire whole vehicles to dismantle them for the resale of their parts, selling the remains as scrap. They may periodically sell whole salvage vehicles at retail. In addition to the Foreign Salvage Vehicle Dealer (Class H) and the Used Vehicle Parts Dealer (Class C), this is the only other dealer classification possessing the authority to buy late model distressed vehicles (salvage or scrap) or late model major component parts through auctions, brokers, or salvage pools in Michigan. Insurance companies may sell directly to Scrap Metal Processors (Class F). 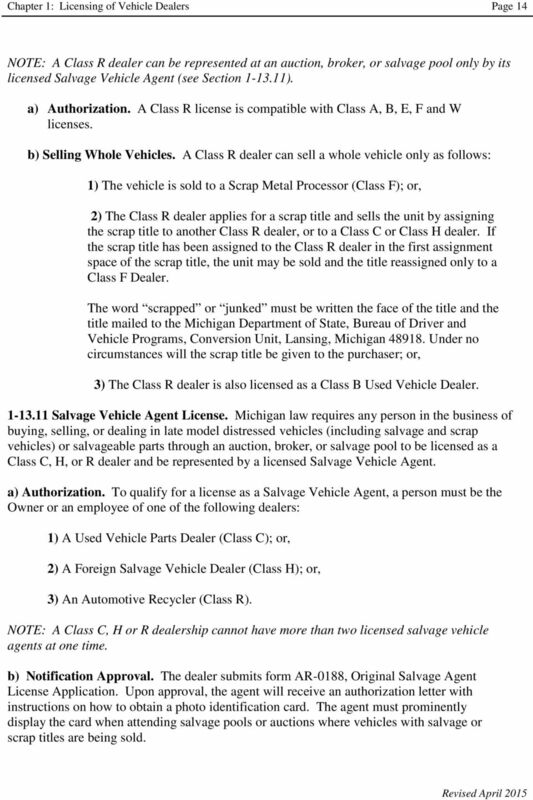 14 Chapter 1: Licensing of Vehicle Dealers Page 14 NOTE: A Class R dealer can be represented at an auction, broker, or salvage pool only by its licensed Salvage Vehicle Agent (see Section ). a) Authorization. A Class R license is compatible with Class A, B, E, F and W licenses. b) Selling Whole Vehicles. A Class R dealer can sell a whole vehicle only as follows: 1) The vehicle is sold to a Scrap Metal Processor (Class F); or, 2) The Class R dealer applies for a scrap title and sells the unit by assigning the scrap title to another Class R dealer, or to a Class C or Class H dealer. 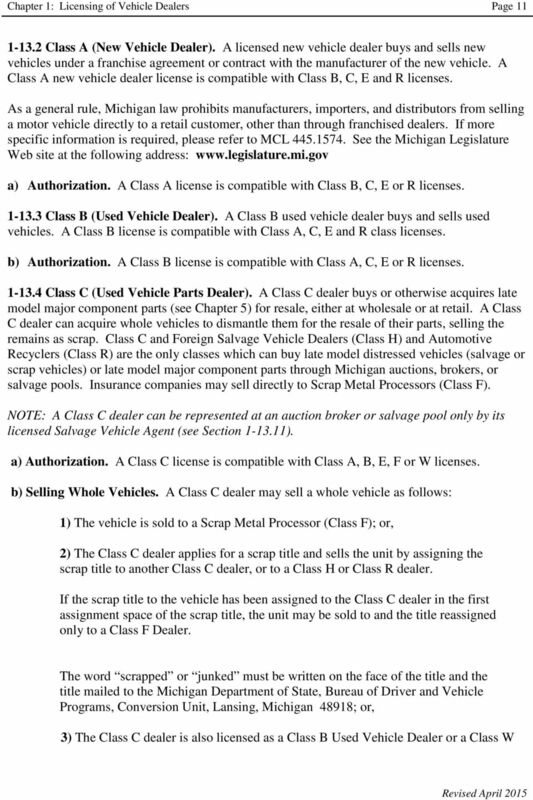 If the scrap title has been assigned to the Class R dealer in the first assignment space of the scrap title, the unit may be sold and the title reassigned only to a Class F Dealer. The word scrapped or junked must be written the face of the title and the title mailed to the Michigan Department of State, Bureau of Driver and Vehicle Programs, Conversion Unit, Lansing, Michigan Under no circumstances will the scrap title be given to the purchaser; or, 3) The Class R dealer is also licensed as a Class B Used Vehicle Dealer Salvage Vehicle Agent License. Michigan law requires any person in the business of buying, selling, or dealing in late model distressed vehicles (including salvage and scrap vehicles) or salvageable parts through an auction, broker, or salvage pool to be licensed as a Class C, H, or R dealer and be represented by a licensed Salvage Vehicle Agent. a) Authorization. To qualify for a license as a Salvage Vehicle Agent, a person must be the Owner or an employee of one of the following dealers: 1) A Used Vehicle Parts Dealer (Class C); or, 2) A Foreign Salvage Vehicle Dealer (Class H); or, 3) An Automotive Recycler (Class R). NOTE: A Class C, H or R dealership cannot have more than two licensed salvage vehicle agents at one time. b) Notification Approval. The dealer submits form AR-0188, Original Salvage Agent License Application. Upon approval, the agent will receive an authorization letter with instructions on how to obtain a photo identification card. The agent must prominently display the card when attending salvage pools or auctions where vehicles with salvage or scrap titles are being sold. 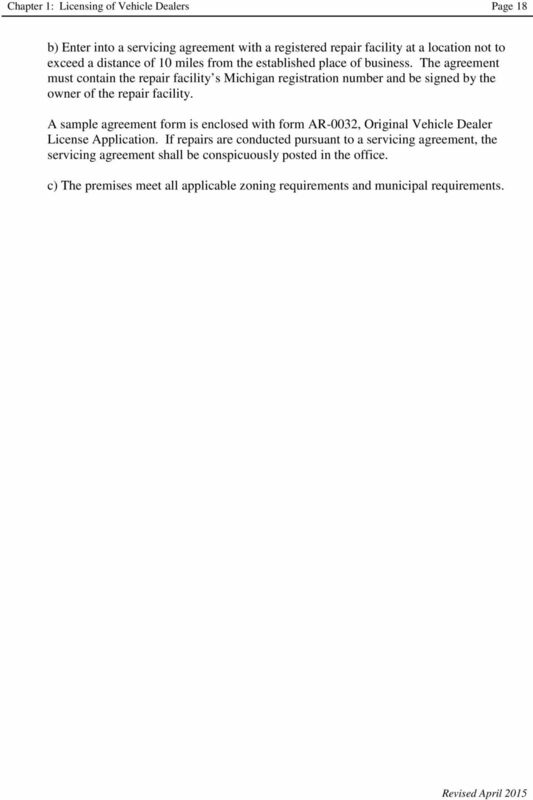 18 Chapter 1: Licensing of Vehicle Dealers Page 18 b) Enter into a servicing agreement with a registered repair facility at a location not to exceed a distance of 10 miles from the established place of business. The agreement must contain the repair facility s Michigan registration number and be signed by the owner of the repair facility. A sample agreement form is enclosed with form AR-0032, Original Vehicle Dealer License Application. If repairs are conducted pursuant to a servicing agreement, the servicing agreement shall be conspicuously posted in the office. c) The premises meet all applicable zoning requirements and municipal requirements. OHIO DEPARTMENT OF PUBLIC SAFETY BUREAU OF MOTOR VEHICLES MOTOR VEHICLE DEALER LICENSING INFORMATION AND INSTRUCTIONS WHO NEEDS A LICENSE? The fee for the license is $100 plus an additional fee of $257.50 for one set of registrations and five license plates. GUIDE TO SECOND HAND MOTOR VEHICLE DEALER LICENSES A license must be obtained before operating a used car motor vehicle dealership. Licensure is valid from the date of the license through December 31. INFORMATION FOR APPLYING FOR A USED MOTOR VEHICLE DEALERS LICENSE The Used Motor Vehicle Division meets six times per year. Please refer to the board meeting schedule on the internet. The website is www.sos.ga.gov/plb/usedcar. This chapter shall be known as the "Rhode Island Self-Service Storage Facility Act." Commercial Licensing Regulation 4 - Motor Vehicle Body Repair. C. "Applicant" means a Person filing an application for a Motor Vehicle Body License. 10. PROOF OF USABLE PHONE listed with local directory assistance in the business name and lot address as it appears on the initial application.